Jakarta, September 9th 2014 – Archipelago International continues to expand it design oriented superior select service Hotel NEO throughout Bali, this time entering Bali’s commercial and administrative heart on Jalan Gatot Subroto in Denpasar. The Hotel NEO Gatot Subroto targets Bali’s growing MICE industry and aims to deliver a proficient hotel and a chick environment at a reasonable price point. The all non smoking hotel consist of 112 modern rooms and the newest and probably hippest low cost meeting venues and conference rooms in Bali’s capital. Business travelers can make use of the 3 meeting rooms grouped around a covered but essentially open air pre function space ideally suited for cocktail receptions, café breaks and BBQ parties, free high-speed Wi-Fi throughout the entire hotel, express check-in & check-out facilities and ample of parking space. Down time can then be enjoyed at the hotel's swimming pool and the signature “Noodles Now” coffee shop. Additional facilities also include a hotel laundry service, a security key card system as well as 24 hour front desk facilities & security. All room rates are intentionally affordable for everyone while exclusive benefits are reserved for online customer bookings via the group’s website www.NeoHotels.com. “Indonesia’s phenomenal economic growth and an ever growing and more and more affluent middle class set to soon represent 140 million people as well as demographic shifts towards a younger and more style conscious consumer have increased demand for affordable life-style hotels fully equipped with complete facilities. NEO hotels answer this demand by offering a chic hotel concept with amenities that are usually found in more expensive hotels. Considering that Bali is one of the top tourism destinations in the world, we are confident that NEO Gatot Subroto - Bali will be another welcomed addition to our NEO portfolio in Bali which will soon also see hotel openings in Kuta, Legian and Petitenget ” says Norbert Vas, Vice President Sales & Marketing Archipelago International. Seen in the image : Mrs. Happy Lutjika as Director of Sales and Marketing of Archipelago International, Mr. Wayan Garutma Utama as Hotel Manager of Hotel NEO Gatot Subroto Bali, Mr. Norbert Vas as Vice President Sales & Marketing of Archipelago International and Ms. Nita Janita Ekaniana as Public Relations Manager of Archipelago International along with Bali's media during Press Conference event Opening of Hotel NEO Gatot Subroto Bali. Seen in the image : Mr. Wayan Garutma Utama as Hotel Manager of Hotel NEO Gatot Subroto Bali, Mrs. Happy Lutjika as Director of Sales and Marketing of Archipelago International, Mrs. Ida Ayu Ketut Caturini as Managing Director of PT. Graha Sastra Loka and Mr. Ida Bagus Putra Arimbawa as Commisioner of PT. Sastra Mas Estetika during Opening event. 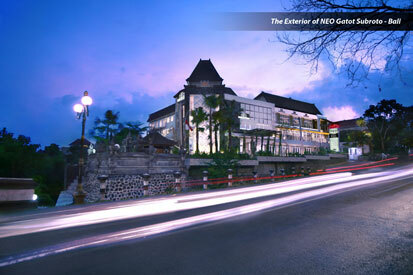 Exterior of Hotel NEO Gatot Subroto Bali.